Veritas ‘Man on the Street’: What will you miss about the senior class? Veritas Staff’s Joe Taft and Kaylee Ellis put together this video getting students and teachers’ reaction to the Class of 2016. What will you miss about those lovable seniors? The RHS Pentelic Chapter of the National Honor Society held its annual induction of new members on Wednesday, May 19. Senior NHS President Ryan Sugrue presided as sixteen juniors and two seniors were inducted. They include juniors, Noelle Atkins, Erin Buckley, Julia DiCienzo, Luana Lima, Shannon Lindahl, Jessica Lutts, Colleen McCarthy, Christopher McHugh, Michael McPeck, Vivian Nguyen, Kaylee Patten, Dana Peck, Meghan Saucier, Sean Vo, Sydney Wells, Mohammed Youssef and seniors Kylie McKenna and Fanting Zhou. Senior members (shown in photo) were also recognized. Each senior member stood as NHS Secretary Haley Macray called the roll and announced the school that each will attend next year. 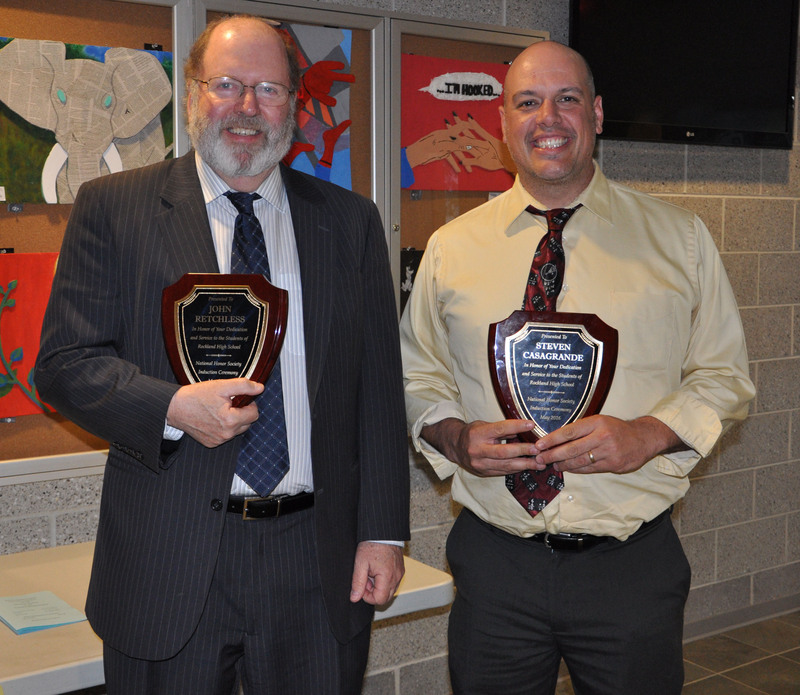 In a traditional salute to their educational mentors, two honorary members of the seniors’ choice were inducted: math teacher, Steven Casagrande and Superintendent of Schools, John Retchless. NHS Officers: Seniors Sarah Margolis, Haley Macray, Ryan Sugrue and Meghan Foster. Veritas photo. Two Rockland High School student print publications, The Veritas and Images Magazine, received Highest Achievement Awards on Tuesday, May 2 at the New England Scholastic Press Association’s annual conference. 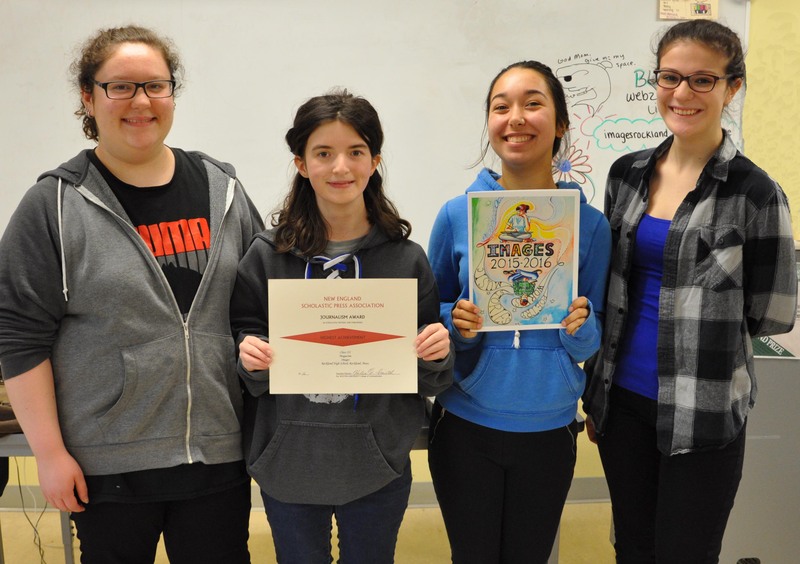 Celia Rosa, Sarah Hunter, Luana Lima and Lauren Zaremba are excited to hear about Images’ Highest Achievement Award. Highest Achievement awards, according to NESPA Director Helen Smith, are given to only those publications considered to be of highest quality in content and editing. 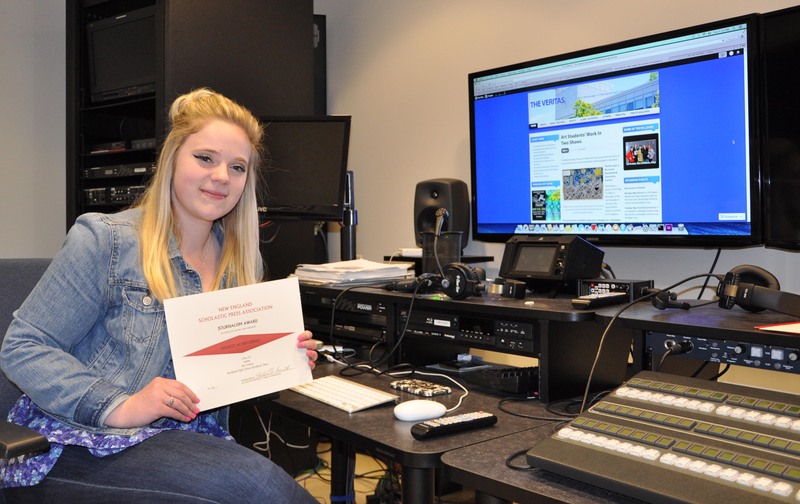 In addition, the Veritas website also received a Highest Achievement award. 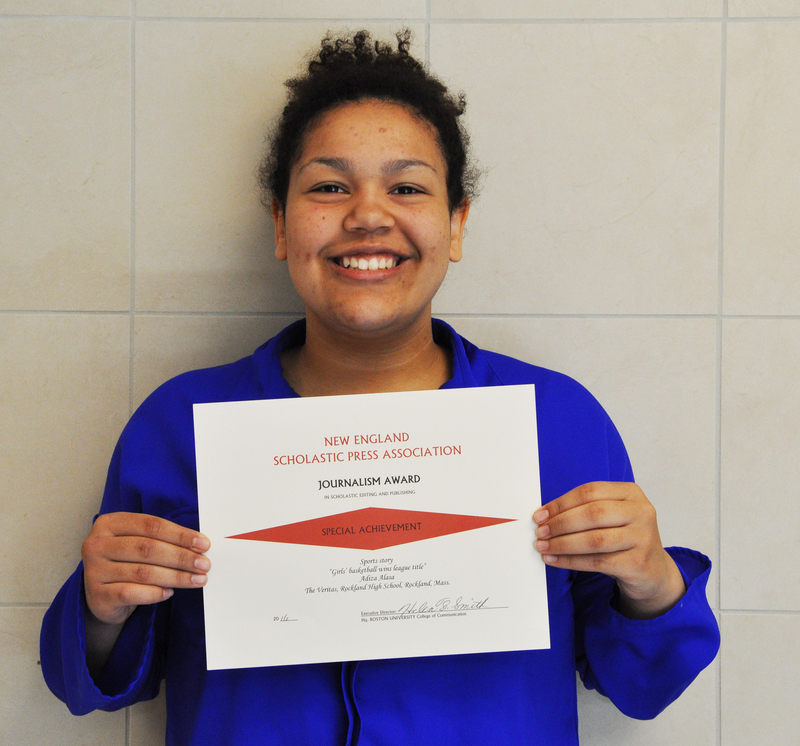 With a Highest Achievement designation each publication is then entered into the All-New England contest. This year, for the second year in a row, The Veritas newspaper came in first in the All-New England contest in Class III. Awards are given in four classifications that are based on student enrollment. A school with an enrollment between 400 and 699 students is Class III. Individual Special Achievement Awards were also announced at the conference. Adiza Alasa, a freshman in the Journalism class received an award for her sports story, “Girls basketball team wins league title,” printed in the February edition of the Veritas. Smith said that Special Achievement Awards are given to individual stories, photos, and graphic designs that are “truly exemplary.” Out of over 1,000 individual entries, only 125 students were recognized individually. Alasa’s story competed against student submissions in all four enrollment classes.